In the past few months I was fortunate to be a part of a very effective team. Comprised of both undergraduate and postgraduate students we were each somewhat equipped with our specialties coming into this elective. 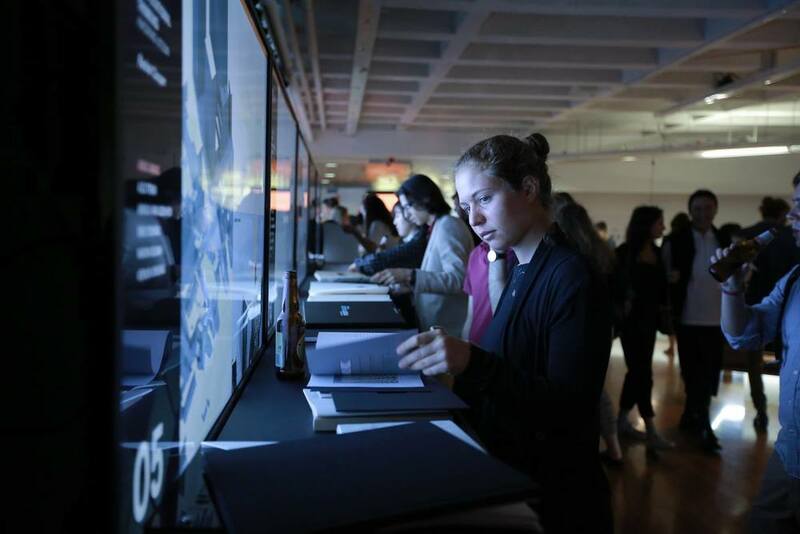 Our task was to organise and host the annual graduate exhibition for the Faculty of Architecture, Design & Planning at the University of Sydney. 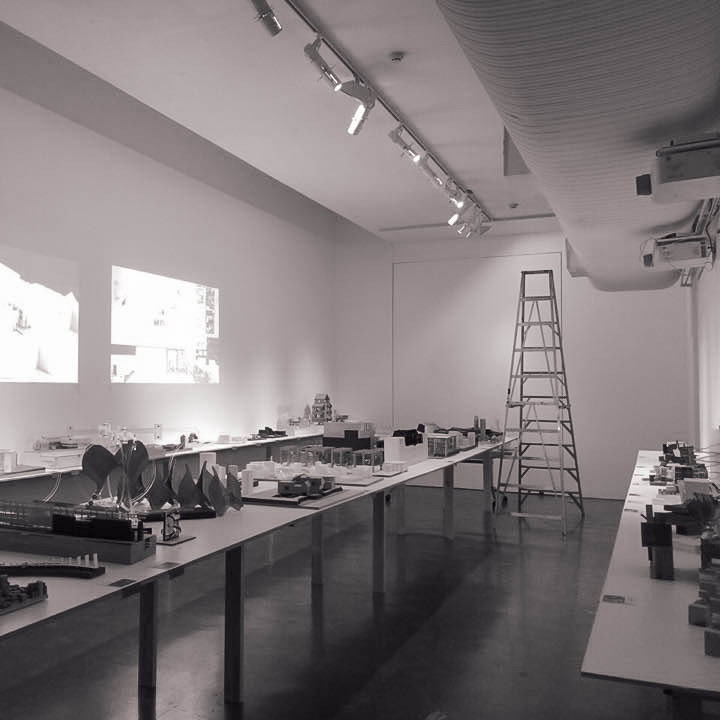 We were ambitious, eager to re-invent the norm, to innovate new ways to showcase student works, to embrace the specificity in their design studios, and to reaffirm the identity of Sydney University to the wider community. During these many weeks I took on the role of digital media, or any materials, equipment, structure and layout concerning the use of projections. Many aspects of these roles involved liaising with Matthew Storey (Technical Services and Asset Manager), Iakovos Amperidis (Tin Sheds Gallery Manager), Julius Dimataga (Building Attendant / Loans Officer), Leslie George (IT Operations and Liaison Manager, ICTC) & Christina Rita (External & Professional Engagement Officer) in the later stages of implementation. This was of course achieved under the guidance of our unit coordinator Dr. Sandra Löschke. We had come to the agreement that careful and controlled use of light is crucial to the exhibition. The manner in which we were to implement this was a result of precedent research and the investigation in to design brief. Our group was assigned with the stimulus of the Sea as a generative idea to design a proposal in the Hearth to display undergraduate works. After days of discussion and research we proposed using low profile plinth structures underlined with LED strip lighting to allow light to flow out from the bottom and reflected on the wooden floor boards. 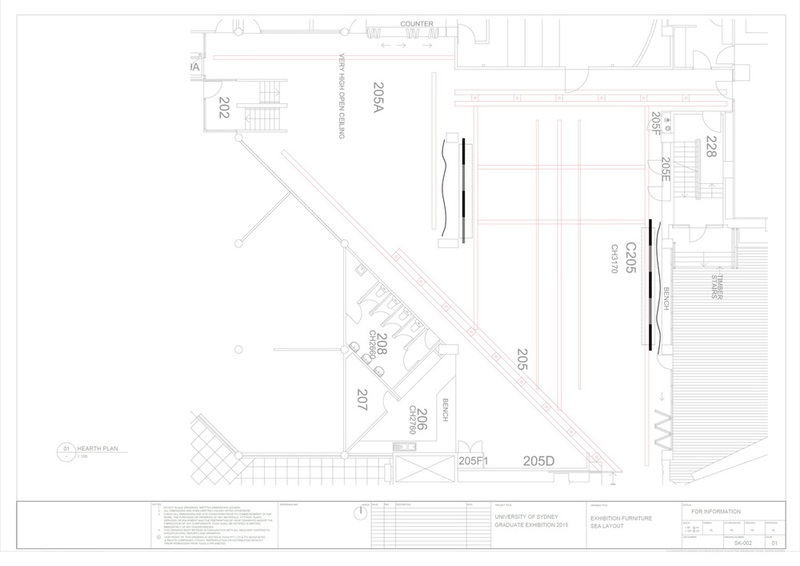 The layout of these plinth structures raised many debates over the planning phase. One the one hand there was the desire for their layout to be free and a still capture of something dynamic and transient, on the other hand they needed a sense of clarity and correlation to the rest of the works. These qualities would have direct Impact on how viewers experience the work. 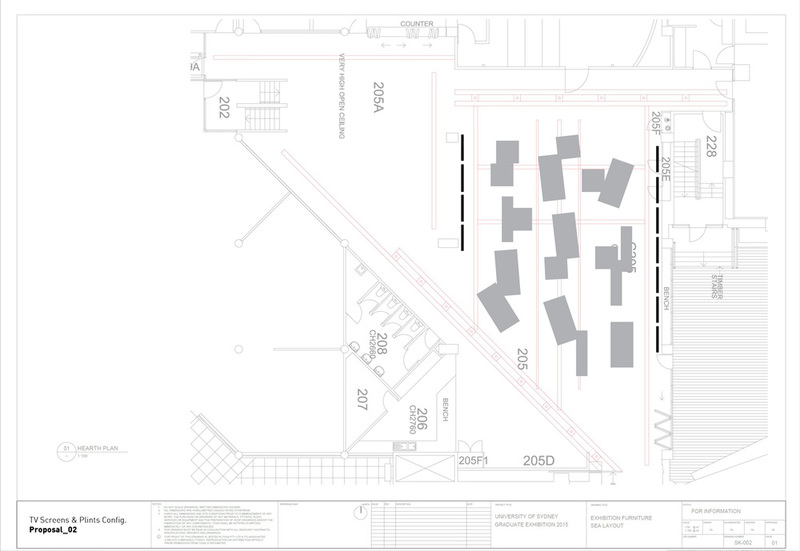 Since we were at the time uncertain of the numbers of submission and the disparities of submissions between tutor groups we found it difficult to finalise on a layout plan. Another issue we had to face was the electrical aspect of the Hearth. Being able to connect to the power grid with minimal cabling was preferred. Other than the power required for the strip lighting LEDs, the key lighting on to the top of the plinths would need to hang directly from the light trays above. Due to a Health & Safety concern involving the cabling needed for the LED strips (initially cable was going to be Gaffer-taped onto the floor), Matthew Storey (Technical Services and Asset Manager) proposed the use of independent batteries housed inside the base structures so there would be no visible wiring. The result added to the overall clarity & minimalism of these display structures. As seen above the visualisation done in the initial planning bears resemblance to the final outcome of the plinths. In conjunction with the screens and wall projection at the back wall, a clear programmatic language was established: strongly lit areas were display zones, moderately lit areas were circulation spaces; dark areas set the boundaries to the exhibition space (curtains). Aligning with the curatorial facet of this year exhibition, we decided to replace the traditional model/panel display typology with plinths & screens as display structure & medium, respectively. The screens in which student graphics were to be shown were proposed to be the 60-inch displays commonly used in architectural studio tutorials at the Faculty. A significant effect of showcasing by means of HDTVs as opposed to the conventional printed panel is its scale and luminosity. Comparatively, works shown on TV give a more dominant visual impact at a much larger scale. The luminosity of these screens served as a great advantage contrasted with the dark surrounds. The potential of transience and dynamism of a digital display screen was also exciting in terms of its effectiveness to showcase a large amount of work while retaining viewer interest in the content, instead of flooding viewers with large amounts of information at once (similar to what UTS has done with their architecture exhibition weeks before). The questions then became to be: what to include in the screens, how are the works identified, categorised? How do the displayed graphics link to other student works? If there are transitions, how is timing controlled? Are the presentations looped? How do viewers locate a certain individual's work within the cohort? Furthermore, the process of collecting materials from students and the latter process of assembly and composition is laborious. How then to minimise the labour involved and streamline the whole workflow? We also proposed a structure to cover the stands of the TVs, the design of this structure took to a few stages of evolution before we outsourced the work to the wonderful builder Paul, whom had taken over the rest of the construction and installation of the wall structure and the curtains behind. As seen above the design of the TV slides began as a convoluted panel-esque layout which had to be simplified and clarified. The more pragmatic aspect also posed an issue, the relatively low ppi (pixel per inch) of the screens mean less detail can be incorporated. It was therefore logical to allow the graphics to be full bleed, single 'hero' images. The second proposals were much more minimal and elegant. However, the overall light tone of the scheme was problematic as the legibility of the student names were relatively low, in additional to the surplus of light projected to the surrounds as a result of an overall bright screen. In the following week a dark scheme was proposed the following week. This scheme was used in the final exhibition and had aligned with the overall aesthetics of the space much more appropriately. The black bar and top red accent stripe also serve to unite the visual identity of the screens and the hearth colour scheme. This format was then finalised and the necessary documents, including the submission instructions document below, were sent out to the students. Each student was to submit a maximum of three slides with the prescribed dimensions. Menu bar elements were added after to all the submission and compiled into slideshows, each slide was given 9 seconds air time with 1 second fade transitions, the presentation ends on a white on black logo slide before looping to the start again. As seen in the initial picture of the available 60 inch TVs on stands, the external wiring would be visible without structures covering them, which would work against the aesthetics of the neighbouring plinths. As a result, we proposed the construction of a simple structure to hide the stands, the design of this structure ultimately served not only to hide unwanted cabling, but also as portfolio stands for portfolios directly associated to the slides shown. A decision was also made to raise the TVs to eye level by stacking cinder blocks underneath. The entire back wall spans black curtains to complete the black background from floor to ceiling, amplifying the effect of the luminous screens. The photograph projection in the Tin Sheds Gallery - Master's model display room was significant in its role to add an extra layer of supplementary information as well as a contextual fabric to the models on display. There was also the aspect of media rotation, consistent with the approach taken in the Hearth. Many thanks to Tiffany Liew & Sean Wong for assisting in crediting the works which enabled a consistent number of works displayed per student. The overall mood of an exhibition can be greatly manipulated by projected light and motion pictures. The 'mood' here refers to the holistic sense of ambience and atmosphere evoked by subtle movements, transitions & colours. These were also effective ways to tie different parts of the exhibition program together, i.e the junction between outside and inside (entrance), the junction between undergraduate & postgraduate exhibition spaces. The below shows elements or parts of the animations used in the final exhibition projections. Using the colour scheme of the Tin Shed's display structures, this simple animation was created to serve as ambient lighting for the undergraduate display space, as well as a transitory signifier to the colourful display of postgraduate works in the Tin Sheds. This setup on the far wall involving three Casio projectors was by far the most challenging setup in its technicalities in installation and cabling. Large amounts of liaising with Faulty staff was needed during the installation process. I'd like to thank them for their assistance. Since the 'hardware' installation of curtains, projectors & TVs as well as the construction of the TV walls were taken care of by staff, my responsibilities were half liaison to make sure we kept to schedule, and half wiring electrical and data cables between projectors and Mac minis. The basic setup was that each projector device was connected to its own power source, their input data sent from a Mac minis (each also with their own power source) via HDMI cables. As the number of projector device/screen increased, the complexity of cabling followed suit. The wall illuminated by three projectors on the far side of the Hearth proved to be a challenge as the signal of one Mac mini had to be split to three separate output devices. A signal splitting device was needed to enable the signal to be relayed to the third projector. The software within the Mac mini needed to be set so the projectors are recognised as the three duplicated outputs, no split screening was required contrary to the original plan. Three projector setup shown above, with signal relaying from right to left. Entry screen programmed by IT and External Engagement to play a looped introductory animation outlined in the projection section above. The opening night of the exhibition attracted an enthusiastic crowd both from the graduating student body, industry professions and the local community. 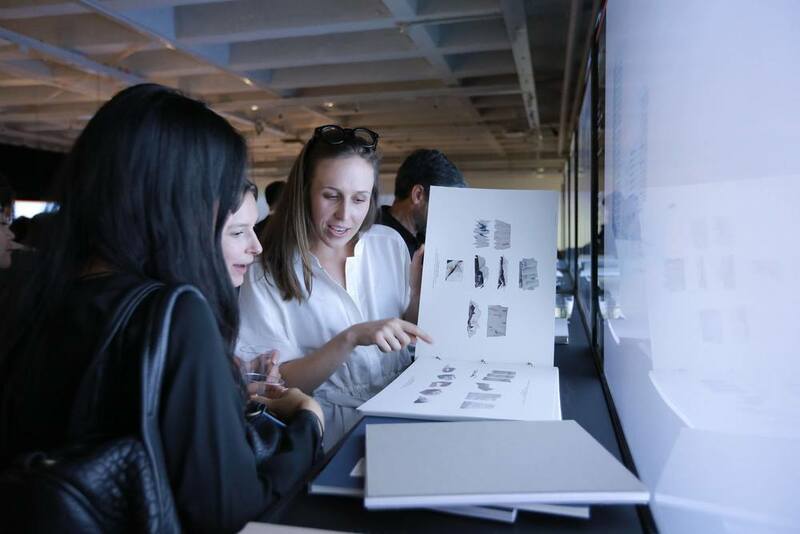 The exhibition was considered a great success, it had again brought the Architecture Faculty into the limelight by engaging through curatorial design that emanated clarity and programmatic fluidity. However, it was mentioned by peers that student works could have been made more relatable to the models for more effective viewing of projects as wholes. 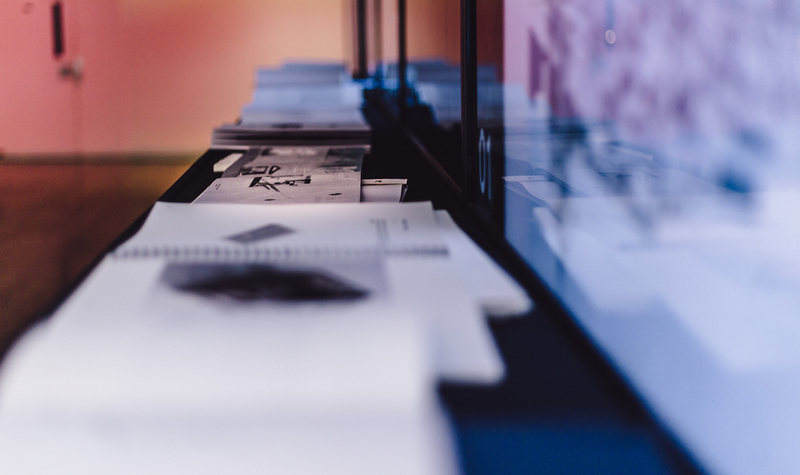 The slight inadequacy in this aspect was perhaps the result of inconsistent student submissions, which could be easily amended in the future through effective communication earlier in the semester to establish a clear expectation of deliverables before studio submission so the exhibition can be taken into consideration early in their design process. All in all, this semester's efforts have been a great success under the meticulous guidance of Dr. Sandra Löschke. I am grateful for this opportunity and once again many thanks to the team and staff involved. It has been the wonderful experience. ABN: 13 993 476 802 | All rights reserved. James Feng Design© 2018.